Aghast, I opened the book to discover that he's actually one of Aquaman's foes called -- I kid you not -- "Fisherman". With a name like that, you'd expect to find him asleep in a boat with a line in the water and a six pack in the cooler, but apparently he's a little more motivated than your average angler. More the pity for me, the unsuspecting viewer stunned by the character concept while innocently perusing a comic book cover. Here's a quick note to all of you future super-hero designers out there: never, ever, ever have a character with large pole sticking out of his crotch. And if for some reason you find yourself doing exactly that, by all that's holy do not force him to grab that pole and jerk it towards his enemy to unleash his powers! I will leave the content of the dialog balloon (undoubtedly filled with cheap innuendos) for this particular image as an exercise for the reader. Some of you will probably think up unbearably clever and inappropriate things he might be saying, and will post them in comments, which will force me to pretend I am dismayed while in reality I cackle with glee. Is it just me or is he wearing a leopard skin coif….WTF??? Well, you know, so he can blend in under the sea like a leopard … umm .. yeah, you’re right, that makes no sense at all. 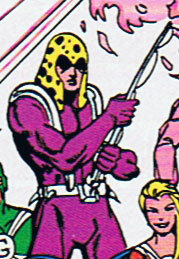 I haven’t actually read the comics, but according to Wikipedia, the thing on his head is some kind of alien parasite. This means it’s probably responsible for the bad images, and the poor sap underneath is screaming in his head for it to stop. Sorry about that, Brad, I wasn’t sure what the etiquette was on notifying about editing so I didn’t say anything, which in retrospect was probably not the best idea. The rest of your post was hysterical, but the one phrase was a bit over the line for me. Reading it, I realized that I’ve posted a few lighthearted articles that could be taken as derogatory towards homosexuals, and that’s absolutely the last thing I want to do. I’m not gay but I’ve actually had anti-homosexual slurs yelled at me in a case of mistaken identity, and I’ve had some very dear friends who were gay, so I’m a bit sensitive to that sort of thing. Anyway, I may have been a bit overzealous in this case, and I apologize for not notifying you directly at the time, but I’d rather go a bit too far in trying to avoid hurting someone’s feelings than not far enough, and turn what was intended as a humorous observation into something that would drive people away. O_o Okay Jeff, no problem. I agree… that probably did go a bit far. So, all in all, I agree, it’s better to censor a little so that we can all have our Schlitz and giggles. ROTFL!! dude who the hell though this guy up? And were they on crack?